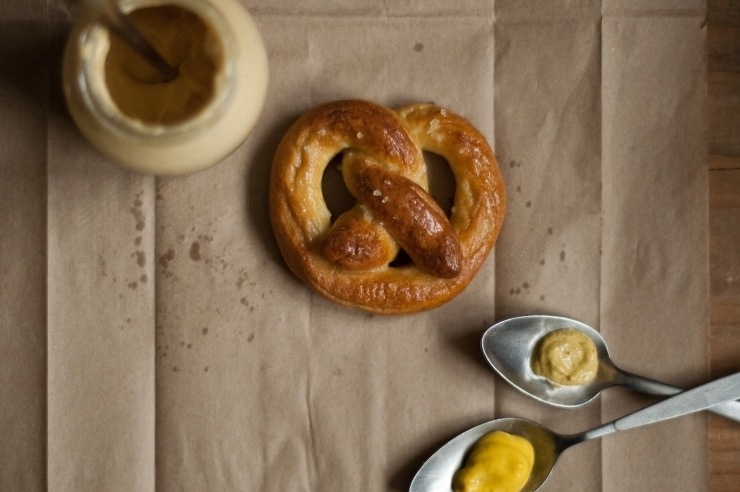 Before I open up a new planner book with “2011” marked across its pages, I’d like to squeeze one last post into 2010- A New York-Style Soft Pretzel Recipe. It’s the kind of soft pretzel that many people crave after visiting the busy streets of New York. It’s what a native New Yorker would crave after moving into middle-of-nowhere New Jersey (at least in my case). It’s the pretzel that I remember my parents buying me and my sister when we were younger. During the summer months, my sister and I would ask our parents for the full-of-sugar snow cones sold by elderly men scraping at huge blocks of ice at carts bombarded with lines of sweating people holding dollar bills in their hands. During the winter months, my sister and I would ask our parents for the warm, butter, soft pretzels sold on every corner between Penn Station and Times Square. Have you ever bought something from a pretzel vendor? It’s as if a drug deal is going down, but with pretzels. “I’d like some of your finest crack a pretzel please.” And then, you take a couple bucks out of your pocket, hand it to the pretzel dealer vendor, and he hands you a nice warm pretzel. You pick up the yellow bottle placed in front of you, squeeze a generous amount of fluorescent yellow mustard around the entire pretzel, and make your merry way around New York City, while the pretzel kindly (because pretzels can be kind, just like humans and cats) warms your fingers, as your other hand hides in your coat pocket from the gelid winter breeze. After craving New York soft pretzels, I decided that it was time to re-create them at home, but with less salt. And I was quite pleased with the results. The color and the taste were spot-on. When it comes to making any bread dough, I do everything by hand. No machinery is needed for this soft pretzel recipe, but if you are short on time, or don’t have the energy to knead for a good 5-10 minutes, I’ve included instructions on how to make the dough in a stand mixer. When measuring the flour for the dough, I used a scale (if you don’t have one, it’s time to make the best $25 investment you will ever make). If you do not own a scale, when measuring the flour, be sure not to compact the flour into the measuring cup; fluff the flour in its container and spoon it [lightly] into the measuring cup, and use the back of a knife (or a spatula) to level the flour. Do not tap the sides of the measuring cup, as this will also compact the flour. 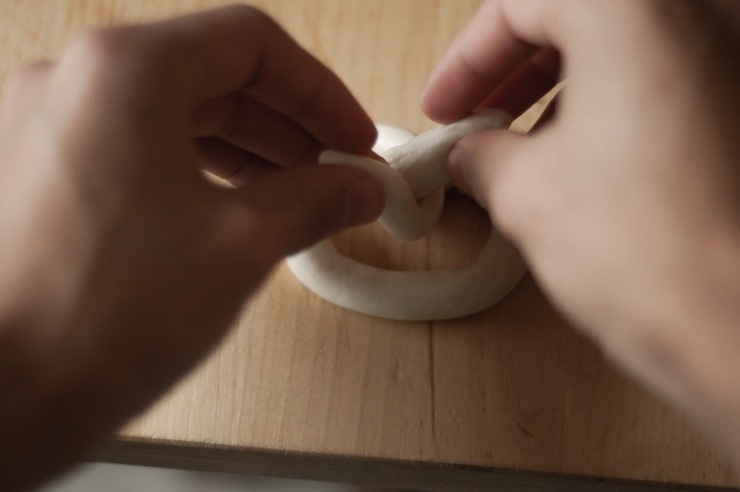 For shaping the pretzels, refer to the four photos in the blog post. Mix yeast, sea salt, sugar, and warm water in a small bowl, whisking until sugar dissolves. Let stand until foamy, about 5 to 10 minutes (Kamran Note: I let it sit for about 8 minutes). Place flour into a large bowl. Using two butter knives, a pastry cutter, or your fingertips, cut the butter into the flour until the mixture resembles coarse crumbs. Slowly pour yeast mixture over flour mixture, stirring with a wooden spoon or your hands to combine. 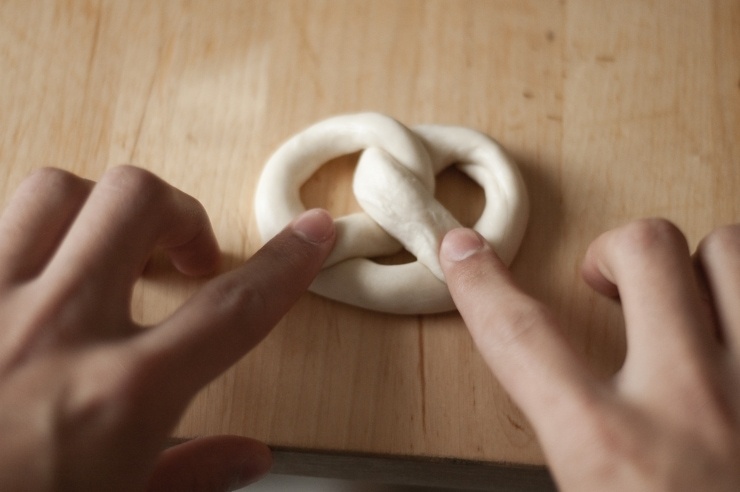 Using your hands, gather dough together. Turn dough onto a lightly floured surface, and knead until it is no longer sticky, about 5 minutes. 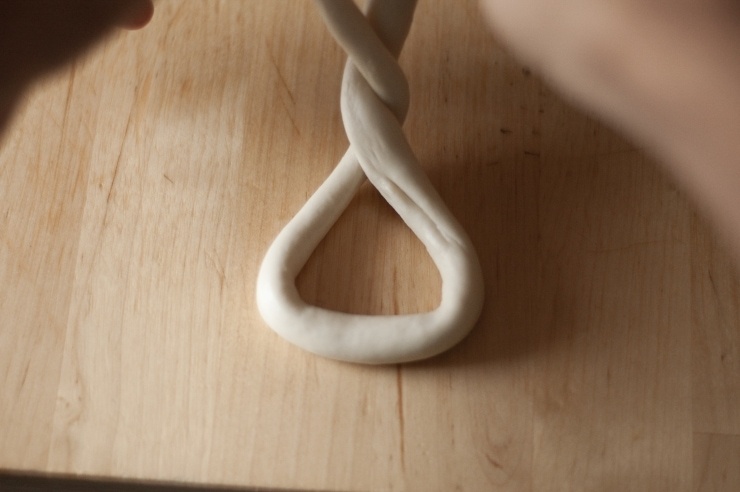 Cut dough into 12 equal pieces, and roll each into an 18-inch rope. Form a U shape with 1 rope, and twist ends together twice. 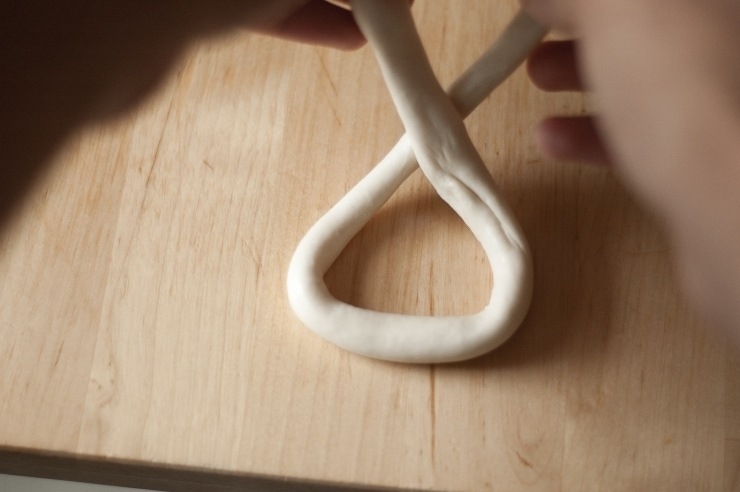 Fold twisted portions backward along center of U shape to form a circle, then gently press ends of rope onto dough to seal. Transfer to an oiled baking sheet, and repeat. Let rise for 20 minutes. Bring a large pot of water to a boil, and add baking soda and 1 ½ tablespoons granulated sugar. Boil pretzels in batches until puffed and slightly shiny, about 30 seconds a side. Transfer to wire racks to drain.Place pretzels on an oiled baking sheet. Mix the 1 teaspoon water and egg in a small bowl. Brush each pretzel with the egg wash. Sprinkle the with the pretzel salt or course grain sea salt (I used the latter). Bake until golden brown and cooked through, about 15 minutes. Pretzels will keep, uncovered at room temperature for up to 12 hours. Re-warm in a 250-degree oven if desired, toast the pretzels on a toaster, and served with mustard. Brilliant photos! Perfect end-of-the-year recipe. Happy New Year, Kam. I’ve so enjoyed reading all your posts this year and look forward to a full (and delicious) 2011! You could have a job at Auntie Anne’s in your future, LOL! I have made pretzels only once and after viewing your post it makes me want to revisit it. Love your pictures, K! Wishing you a Very Happy & Peaceful New Year! OH NY won’t be the same without the scent of pretzels emanating from the street vendors… and yeah you’re so right,as I feel that way whenever I buy those pretzels, I feel like I’m buying some illegal stuff hahah coz they are so good and you have a certain “high” eating and holding the warm pretzels…haha! I miss NYC (live there six years ago) but Im glad I coould re-create NY here in SD by trying your recipe. Im sure it’s going to wake my kids up! YUM! I spent a great deal of my childhood making trips into The City… to see my father at work, to go to a show, to eat an amazing meal. But the memory that sticks with me the most is the time I was given my first soft pretzel. Now, I must admit that I’m not a huge fan of mustard, so I usually eat it naked (with salt of course). New Year Wishes- Thank you! Jennifer- No thank you to the job at Aunt Annie’s, but I do encourage you to make these. 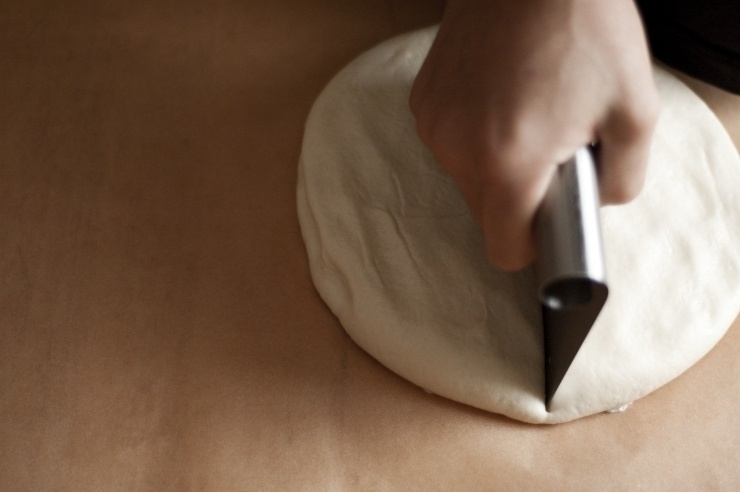 The dough is very easy to handle and is very forgiving. Being a desi, I love spice- do you think adding some green chilies into the dough would work? My son, your site looks more wonderful each time I look at it. I remember when your mom and I would buy you and your sister those warm pretzels. 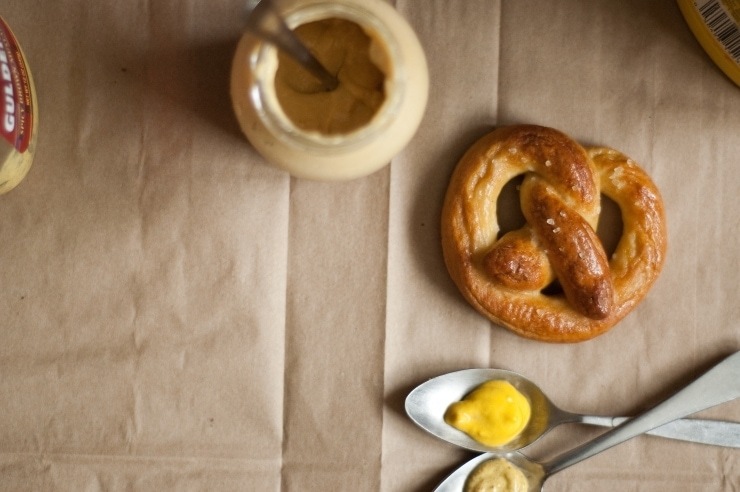 And this recipe: I want you to make these pretzels when you come over. The last time I made one of your recipes, I made the bagel one for you and your sister. I forgot to boil the bagels, and you know what happened. They looked ok but, were hard as bricks. This time, I’ll let the master baker in the family handle all of the baking. Nadia- I don’t see why not. I love a little kick! But chili powder might work just as well… If you do add the chilies, I would suggest dicing them up finely. Dad- Oh, now you’ve finally figured out how to comment on here? Kidding. Thanks so much for being so nice! What do you want, now? I’m kidding again. Sort of. Well, I’ll bring some stuff over to make these for the family . . . I’ll make a huge batch! I wish I could have one of those right now. I miss them so dearly. NYC is one of my fave food cities. I’m digging these pictures! Very cool! When I was in third grade my brother and I would always make cinnamon and sugar pretzels. I’ve never even eaten one! I feel like I’m missing out though, especially reading the sweet story you just wrote! i’ve tried a few different pretzel recipes. these are most definitely my favorite! delish! i tried your bagel recipe as well…. sadly, those were a swing and a miss. :~/ not sure what happened, but i am going to try again for sure. i’m new to your site, but i’m enjoying it. Hi there! I am so glad that these turned out well! As for the bagels, I am surprised that they didn’t turn out well- my father (a non-baker) even managed to make the bagel recipe without my help or advice and they turned out beautifully. Maybe I can help you figure out what went wrong? 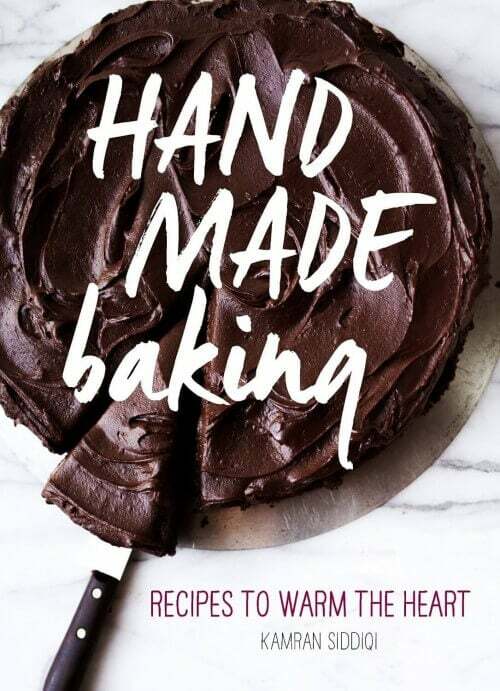 I also started learning to write some recipes .. but when I saw your blog, I was very impressed … his writing is very detailed … I can learn from here, thank you. They sure look pretty on your screen, but mine turned out a total disaster. As soon as they hit the water they just uncoiled and turned into a slimy mess. Is there a trick to preventing them from uncoiling? Hi Lynette- there really isn’t a secret or trick to prevent them from uncoiling other than pressing the ends of the dough together well (there’s no need to be overly-gentle with this step); the dough should stick together. If you’re using flour when you’re taking the dough out of the bowl after it’s rested, while cutting the dough, or while forming the pretzels- that’s the cause of your pretzels uncoiling (it’s preventing the dough from sticking to itself); you don’t need any more flour other than what’s called for in the recipe. These were (are) great! My hubby and I made them tonight. I brushed them with melted butter instead of the egg – otherwise following it exact, and they are ssooo yummy! Soooo… i tried this recipe…. total failure. ._. After i boiled them, total disaster, fell apart in pieces. Then I baked those pieces, trying to save something, still failure. They taste… well… I’ll keep doing cupcakes. Capricila- I apologize that this recipe didn’t turn out well for you. I did receive a couple emails from folks saying that after boiling, their pretzels fell apart. I adjusted the recipe; it now calls for a much shorter boiling time (30seconds per side). Did I miss the directions for doing the pretzels in a standing mixer? I don’t have the strength in my hands to kneed. Thank you so much I can’t wait to try this. These look really good! I have to add them to my “To Make List”!! Just as I thought. I made your bagels yesterday, and they were delicious. And today. I made these. After they were done, I brushed a couple with butter and sprinkled some cinnamon sugar on top. And the rest with salt. They tasted just like a pretzel. I love your site. I found you while searching for something else. And now I’m hooked. I was very surprised to see a young man behind the recipes. Bravo! Can’t believe I only just found your blog – everything looks so delicious!! 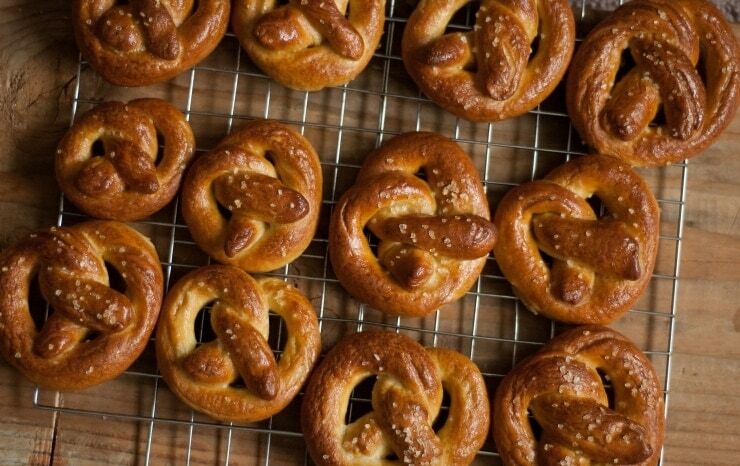 I’m also in love with pretzels so will definitely try these out!! Has anyone tried this recipe but taking out the sugar? Made these as a little rainy day snack for dinner! So good. Thanks for the great recipe. Just got a stand mixer and wanted to use it for the pretzels. You mentioned that you had instructions, but I am not finding them. Can you direct me to them? Thanks so much! Made them today. Tasted delicious and looked great!! Happy New Year! Hi I stumbled across this recipe after searching for Bagel recipes. I’m going to try both. Just two questions. As someone else asked, is there a place with stand mixer directions? And you stated that these will last 12 hours at room temperature. Is there a way to store them longer? If so, how? Ok that was three questions.